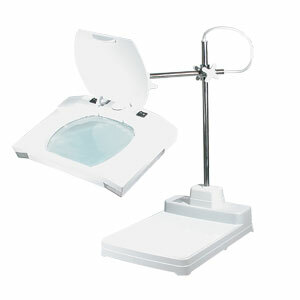 Reizen Magnifying Lamp with Height Adjustable Locking Arm and TableTop Base! • Large glass magnifying lens. • Height adjustable locking arm for comfortable viewing. • Table top base and protective lens cover. The Reizen Magnifying Lamp with height adjustable locking arm and weighted table base is the perfect thing for reading small type or working on intricate projects. Lamp comes with your choice of 3 or 5 diopter glass lens, lens cover and 9W energy saving compact fluorescent bulb. Glass lens measures 7.5" x 6.2".